Proposol is a natural Spray made of propolis, glycerin, alcohol; it is a natural antiseptic and biostimulant with anti-inflammatory, antimicrobial, analgesic and antiviral properties. Proposol Spray boosts tissue regeneration. The Spray is used for oral cavity diseases (gingivitis, stomatitis, tonsillitis, tooth ache); to increase wound healing; for various skin disorders (ulcers, burns, neurodermatitis, acute herpes and otitis). Warning! 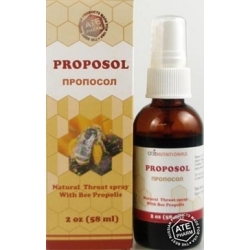 Do not use Proposol Spray if you are hypersensitive or allergic to its components. Side effects. Allergic reactions and possible burning sensation. Warning! Before using any herbal products, make sure that you have full knowledge of how the herb works and any adverse reaction it may cause.